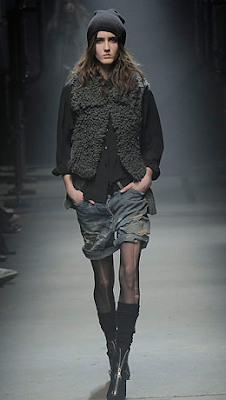 Alexander Wang and Erin Wasson just made grunge look so good again! But darn, these shorts cost $290. Pre-order too at Satine Boutique! i love alexander wang's collection!!! i love alexander wang! i actually was a dresser for this particular show. i think you were in the philippines, but his sample sale just passed. you should definitely go to the next sale in december. it will be all of his fall 08 stuff. there's always a good selection and great prices. this past sale i bought two dresses from the spring 08 runway for only 100 dollars each!! DIY would be fantastic! go for it! Oooohhh rz! A dresser for this show? Can I sign up to be a dresser too for the next Fashion Week?! I'd do it in a heart beat! Tell me all about it! Oh, and great deal you got there on the sample sale! So lucky!!! For $290???!!! Nah! You can buy a couple or two pairs of outfits with it..